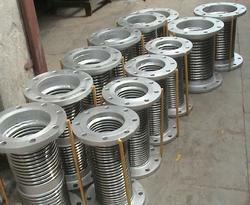 The leading manufacturers of Bellows Expansion Joints in India, MB Metallic Bellows Pvt. Ltd. (MB MBPL) caters to a widely varied clientele. As the outcome of over two decades of intensive R&D work in design, manufacturing and numerous correlation tests, MB MBPL’s Bellows Expansion Joints are a cut above the rest in terms of performance and quality. - applications: Cement plant, refinery plant etc. The range of Pressure Balance Bellows in pressure test position offered by us is specially designed to absorb small amounts of axial and lateral movement along with counteracting the pressure thrust in a system. We are offering Inline Pressure Balanced Type Bellows to our clients. An Inline Pressure Balanced Bellow Assembly is designed to absorb small amounts of axial and lateral movement while counteracting the pressure thrust in a system. This is achieved with a series of rods similar to the Pressure Balanced Elbow Assembly and a balancing bellows with twice the effective area as the line bellows. The elimination of the elbow is what makes this expansion joint unique. 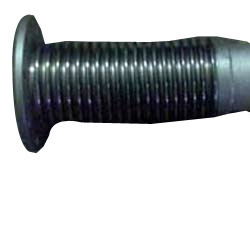 It is designed to absorb axial movement and/or lateral deflection while restraining the pressure thrust by means of tie rods inter-connecting the flow bellows with an opposed bellows also subjected to line pressure. Used in installation that consists of straight runs that cannot provide main anchor to react pressure thrust. Available in pressure Balance Elbow. A pair of single axial bellows tied and blind flanged at one end and an elbow to change the pipe direction. This design is for a constant volume arrangement and eliminates flow turbulence and pressure thrust. - Does not require a change in direction of the piping system.